You know, I've never read any of this series. Are they any good? With the lead novels being written by Laurence Donovan under the name Wallace Brooker, I imagine they'd at least be entertaining. This first issue also contains back-up stories by Harold A. Davis, Carmony Gove, and Kenneth MacNicol. I enjoyed them. 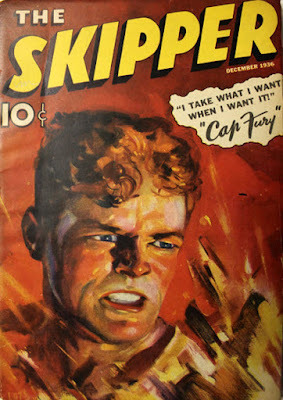 A couple read like Doc Savage. Thanks, Tom. I believe I have a copy of the Sanctum Books volume that reprints a couple of the stories. I'll have to check on that. In fact, I believe I saw in some old index the character originated in backup stories in DOC SAVAGE. You know, even though I haven't read any of these yet (I have one of the reprints already and another on the way), I sort of wish somebody would do a complete collection of them. The more pulp available, the better. I have the Sanctum reprint, and really enjoyed it. Like a more hard bitten sea faring Doc Savage.